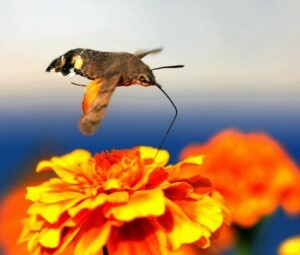 Hummingbird Hawk-moth is a moth that looks very much like a hummingbird in flying and appearance. 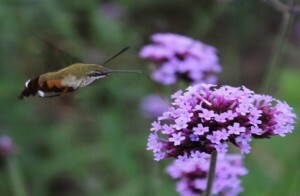 In many areas that are not the inhabits of hummingbirds, many people met hummingbird hawk-moths surprisingly and misjudged them as hummingbirds. Some of them took photos on the moths and posted on some forums with a very confirmed claim that they met a real hummingbird even others told him it’s actually a moth. The moths are usually 1-2 inches in body length, much smaller than hummingbirds who are mostly 3-4 inches in length. 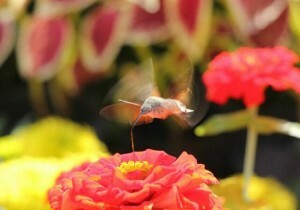 Some birders may regard hummingbird moths as baby hummingbirds, but baby hummingbirds do not fly. The moths have two antennas while birds don’t have. The moths’s wings are transparent while birds’ wings are solid with feathers. The birds have a needle-like long beak, the tongue stretch out of the beak into the flowers to get the nectar. The moths don’t have a beak but a long tongue, the tongue is curled up when the moth is not taking nectar. 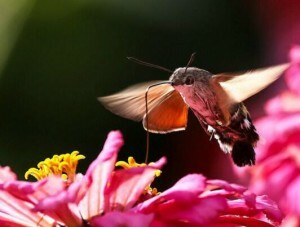 Hummingbirds live only in america, but hummingbird hawk-moth are reported widely in Europe, Asia and America. Hummingbird moths are rare in North America, there are 4 species of hummingbird moths reported in North America. 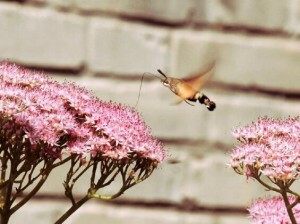 For people who are interested in these tiny wonders, if you notice in your backyard or garden some flying creatures look like hummingbirds but in half size of hummingbirds, they are very possible hummingbird hawk-moths. And you may meet them again in the same place the same time of next day. 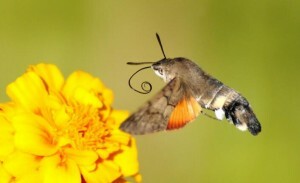 Below are some photos for the lovely creatures: hummingbird hawk-moths.